Anyone worldwide may purchase this Fox Racing Shox product, however, the delivery address must be inside the United States. Green: Used as a bath oil in all Fox Shox forks. It is also the damper oil you will need for all open bath cartridges. Red: Used solely in the older 'Open Bath' forks. Gold: Is intended for 'Fit Damper' forks. 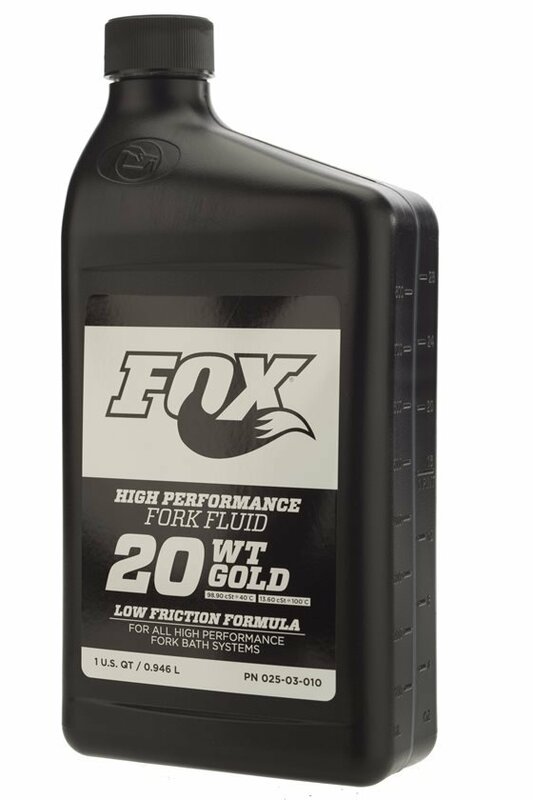 If you are planning on rebuilding your Fox fork, get the green 10W Oil. Some bike shops will give you some oil if you ask, but having a bottle of this is good to have around the shop. There is enough oil for a few rebuilds. Definitely use this when servicing your Fox suspension forks. There's more than enough in this container to service your fork multiple times. Fox recommends changing your suspension oil every 30 hours of riding. If you have a Fox and you want it to work its best, get this and you're good to go hit the trails with one less worry. 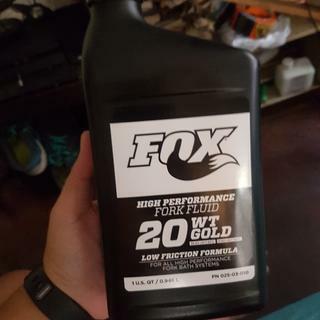 I rebuilt a set of 2011 RC2 Fit Fox 40s and I used this oil. It was easy to pour with a funnel, though I've seen people use syringes. It was more expensive than other non-Fox branded oil, but I'll be able to do around 8-9 rebuilds with this oil, so it's well worth getting. Superb poduct and really good service by jenson usa! Highly recommend this superb product by fox, for basic lower leg service. Within 24hrs the item was delivered already so satisfied. What makes this only 4 star oil? It's suspension oil...you're saving money doing the service yourself, might as well put the OEM stuff in it. Seems good as new with it. great service, super fast shipping! Here's some advice: change your fork oil more often. My forks were clapped out after three or four years of desert riding. New oil and seals made my bike feel new again--a HUGE improvement in handling! This fork fluid is viscus enough to inject into your forks using a syringe. The only improvement would be to come with a measuring device. It's easier than going to the dentist, just get it done. Service you suspension. You know it does make a performance difference, it's not difficult, and it's vital to extending the life of your expensive suspension components. Better buy this product saves a lot of $$ rather than go to a bike for servicing!! 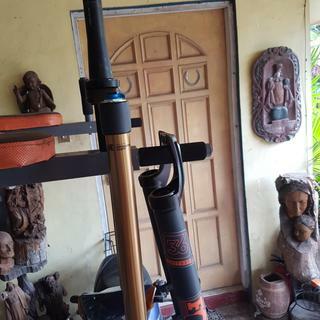 I just finished rebuilding my Manatou marvel pro fork and this fluid made it soo smooth. The first ride after the rebuilt was awesome I would recommend this fluid to anyone rebuilding their suspension fork. Great and high quality product. Replaced the green bath oil with this gold in my 2014 Fox Factory Talas, seems to be very slick and coats the uppers well. Foam rings retain the oil longer, probably due to the higher weight oil. Can't go wrong with the factory spec on fork / shock oil. One of the best oils out there, use it on FOX and Manitou forks and I highly recommend it. great thing to have. most common oil and will be nice to have when i need to do a lower fork service. Expensive, but needed for all older forks prior to the fit forks. Plenty of oil to change multiple forks. Great stuff. I bought a used bike and swapped these as a precaution. In the end, it made a huge difference. Much more plush and less sticking. Changed the oils at the same time that I changed dust wipers and foam rings. Enough oil for many years of service! C/o dust seals on both bikes and serviced the shocks after 4 years of riding, used the SKF seals instead of the flangeless Fox seals which are too difficult to install. Used Fox Gold suspension fluid, boy is the operation ever smooth now with great range of adjustability. The oil was surprising clean after 4 years riding (200 hours riding per year on trails). The only one to buy. Works perfectly every time with no issues. Excellent fluid for fox fork. Used to service my fox float lowers. Smooth performance like new. Highly recommend. Bought this for a rebuilt of a 2012 Fox 36 fork that came on my daughter's second hand Blur LT2. Not much to say about it...it's suspension oil...it's clean, cheap, and does the job. Fox 20WT is excellent for the lowers. It feels tacky while smooth. Best price from Jenson. Needed to change fork seals. No air shipping with this in the box so it took a little longer. Works as expected. Very smooth oil when replacing the old worn out and dirty oil. Used this oil for my 2017 Fox 36 Elite Air Side. Not too expensive and will last you for many service to come. After reading from the fox website I was confident this was the correct suspension fluid. Fox has a very good website for maintenance of there products. Much nicer than old green stuff. This with a set of low friction seals has made my factory 34's feel like new again. Great shock oil. Shock is smooth as butter and set for another 59 hours. Low Friction seals a must! needed for fork seal change. this came quickly and will last a long time. This was the oil that was recommended for my fork. No one locally was selling it at all so I had to buy a whole quart. At least I have plenty of oil to use when re-building my fork from here on out. What can I say, for Fox forks its the right stuff for the job! will you ever get the 10wt green oil back in stock ? I need to replace the upper seals on a FOX F29 RLC suspension fork (32mm OD). These forks were on a 2008 Ellsworth Evolve. What is the correct oil to put back in? Hi. Yes grab a bottle of fox fork fluid as well, 20wt. Kit does not come with fluid.